For over 25 years, senior human resource executives, in-house counsel, and attorneys specializing in employment law have turned to Employee Relations Law Journal Online to find out what the law says, how the courts are ruling, and what to do to comply. 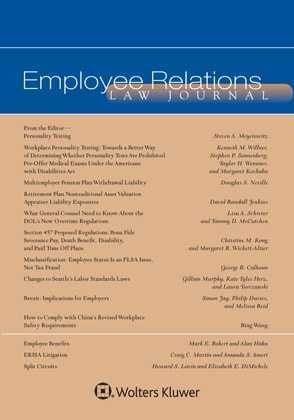 Practicing professionals provide you with clear and authoritative articles on key issues such as the Americans with Disabilities Act, family medical leave, sexual harassment, terminations and RIF's, age discrimination, alternative dispute resolution, key NLRB decisions, controlling benefits costs, and trends in employment law. Regular columnists explore the meaning of new laws, regulations, and cases in benefits, safety and health, and labor-management relations.